Download "EC2105, Professor Laury EXAM 2, FORM A (3/13/02)"
1 EC2105, Professor Laury EXAM 2, FORM A (3/13/02) Print Your Name: ID Number: Multiple Choice (32 questions, 2.5 points each; 80 points total). Clearly indicate (by circling) the ONE BEST response to each of the following questions. 1. Suppose aggregate expenditures in an economy are equal to $7,000 billion. Income in the economy is: a. Less than $7,000 billion. b. Greater than $7,000 billion. c. Exactly $7,000 billion. d. Somewhere between $7,000 billion and $8,000 billion. 2. If the minimum wage decreases, in the short run we expect to see: a. Aggregate demand shifts left, the price level falls, and real output falls. b. Aggregate demand shifts right, the price level rises, and real output rises. c. Aggregate supply shifts down, the price level falls, and real output increases. d. Aggregate supply shifts up, the price level rises, and real output decreases. 3. The aggregate demand curve slopes down and to the right because: a. As the price level declines, the real value of money increases, and therefore people purchase more. b. A lower price level causes us to buy more foreign goods and fewer domestic goods, causing an increase in net exports. c. As the price level declines, interest rates increase and stimulate expenditures. d. As the price level falls, the interest rate falls, and net exports decline. 4. Suppose the government increases investment tax credits (in other words investment becomes less expensive). This is an example of: a. Monetary Policy. b. Fiscal Policy. c. Supply Side Policies. d. Incomes Policies. 5. Net exports are defined as: a. GDP minus exports. b. Exports minus imports. c. Imports minus exports. d. Exports plus imports. 6. Which of the following will most likely cause an increase (shift to the right) in a nation s potential output curve? a. An increase in national debt. b. A decrease in the productivity of the labor force. c. An increase in the productivity of the labor force. d. An increase in aggregate demand. 2 7. If a broad increase in the price of stocks causes an increase in the real wealth of individuals, then: a. The aggregate demand curve will shift to the left. b. There will be a movement up and to the left along the same aggregate demand curve. c. The overall price level will fall. d. The aggregate demand curve will shift to the right. 8. Comparisons of GDP levels across countries are least accurate when: a. Non-market activities are a small part of total economic activity. b. Prices differ across countries. c. Prices differ across countries and non-market activities are a large part of total economic activity. d. Purchasing power is about equal across countries. 9. A lower U.S. price level will cause U.S. exports to and U.S. imports to. a. increase, increase as well b. increase, decrease c. decrease, increase d. decrease, decrease as well 10. Which group of economists places the greatest emphasis on the short run? a. Classical economists. b. Keynesian economists. c. Laissez-faire economists. d. Marxian economists. 11. In the mid-1990s, Treasury Secretary Rubin was pressuring Japan to institute policies to improve its weak economy. What effect would these policies have on the U.S.? a. They would cause the U.S. to move up its aggregate demand curve. b. They would cause the U.S. to move down its aggregate demand curve. 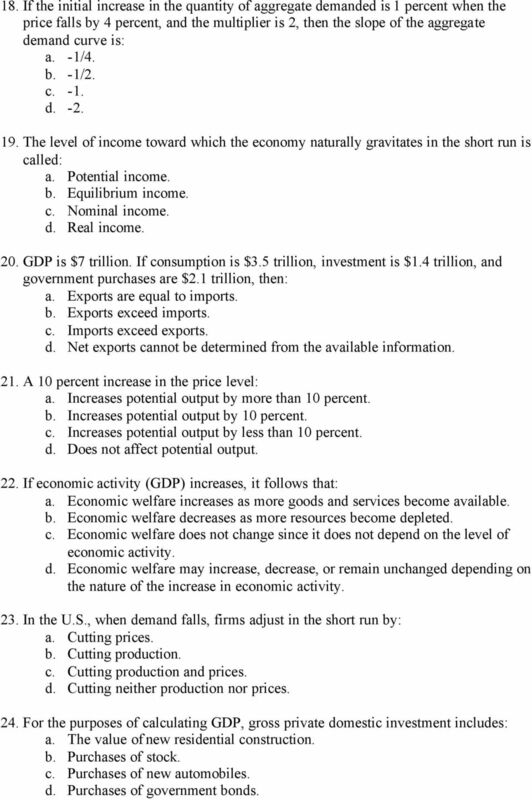 c. They would shift the U.S. aggregate demand curve to the left. 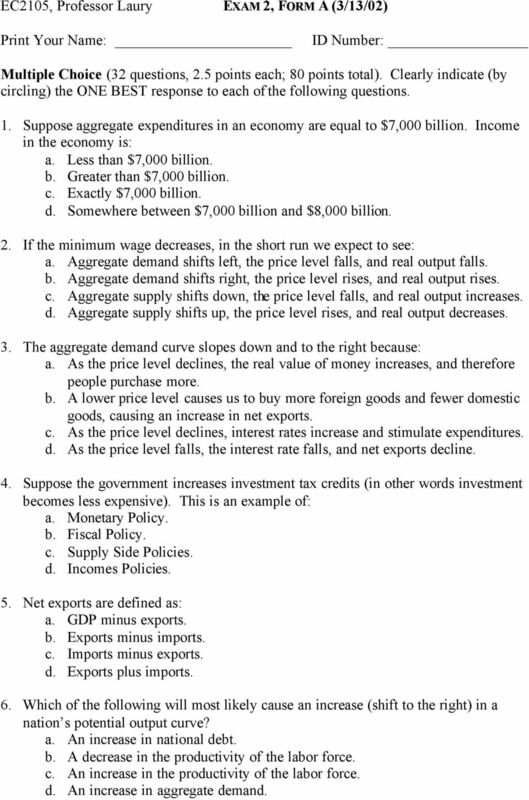 d. They would shift the U.S. aggregate demand curve to the right. 12. In 1955 and 1956, the Fed raised interest rates in order to reduce inflationary pressures. This was an example of: a. Monetary Policy. b. Fiscal Policy. c. Supply Side Policies. d. Incomes Policies. 3 13. If productivity increases by 4% but wages also increase by 5%, then it is most likely that: a. The AS curve will shift up. b. The AS curve will shift down. c. The AS curve will not shift. d. The AD curve will shift left. 14. Most economists believe that the potential output curve is vertical because: a. An increase in the price level will loosen the constraint imposed by the economy s resource base and accompanying production possibilities constraint. b. Actual output can never exceed, even temporarily, the output rate implied by the economy s potential output curve. c. In the long run, output depends on resources and the available production technology, not the price level. d. A vertical potential output curve indicates that an increase in aggregate demand will lead to a larger real output but not a larger nominal output. 15. According to the latest GDP release: a. The economy is still in a recession. b. The economy is not growing or declining. c. The economy has begun to expand, but at a lower rate than thought in January. d. The economy has begun to expend, but at a faster rate than thought in January. 16. Changes in GDP can be caused by: a. An increase in aggregate demand. b. A decrease in aggregate demand. c. A decrease in short-run aggregate supply. d. All of the above. 17. Which of the following would not be included in personal consumption expenditures? a. Your college tuition. b. Medical expenses. c. Police protection. d. A movie ticket. 4 18. If the initial increase in the quantity of aggregate demanded is 1 percent when the price falls by 4 percent, and the multiplier is 2, then the slope of the aggregate demand curve is: a. -1/4. b. -1/2. c. -1. d The level of income toward which the economy naturally gravitates in the short run is called: a. Potential income. b. Equilibrium income. c. Nominal income. d. Real income. 20. GDP is $7 trillion. If consumption is $3.5 trillion, investment is $1.4 trillion, and government purchases are $2.1 trillion, then: a. Exports are equal to imports. b. Exports exceed imports. c. Imports exceed exports. d. Net exports cannot be determined from the available information. 21. A 10 percent increase in the price level: a. Increases potential output by more than 10 percent. b. Increases potential output by 10 percent. c. Increases potential output by less than 10 percent. d. Does not affect potential output. 22. If economic activity (GDP) increases, it follows that: a. Economic welfare increases as more goods and services become available. b. Economic welfare decreases as more resources become depleted. c. Economic welfare does not change since it does not depend on the level of economic activity. d. Economic welfare may increase, decrease, or remain unchanged depending on the nature of the increase in economic activity. 23. In the U.S., when demand falls, firms adjust in the short run by: a. Cutting prices. b. Cutting production. c. Cutting production and prices. d. Cutting neither production nor prices. 24. For the purposes of calculating GDP, gross private domestic investment includes: a. The value of new residential construction. b. Purchases of stock. c. Purchases of new automobiles. d. Purchases of government bonds. 5 25. Other things constant, a decrease in resource prices (for example, a fall in the price of electricity) will: a. Increase the cost of producing goods and services, leading to a higher price level. b. Increase costs and lower profit margins, leading to a shift up in aggregate supply. c. Cause the target unemployment rate to rise. d. Decrease costs and increase profit margins, leading to a shift down in aggregate supply. 26. The U.S. unemployment rate: a. Is continuing to increase. b. Has been declining. c. Has been going up and down from month to month. 27. When the U.S. government imposed a 10 percent personal income tax surcharge in 1968 (in other words the increases income taxes), this was an example of: a. Monetary Policy. b. Fiscal Policy. c. Supply Side Policies. d. Incomes Policies. 28. If an increase in foreign income initially increases U.S. aggregate demand by 20, the AD curve will: a. Shift right by more than 20. b. Shift right by less than 20. c. Shift right by exactly 20. d. Shift left by more than An improvement in technology (that reduces costs and boosts productivity) would shift which of the following curves? a. Only the aggregate demand curve. b. The aggregate demand curve and the aggregate supply curve. c. Only the aggregate supply curve. 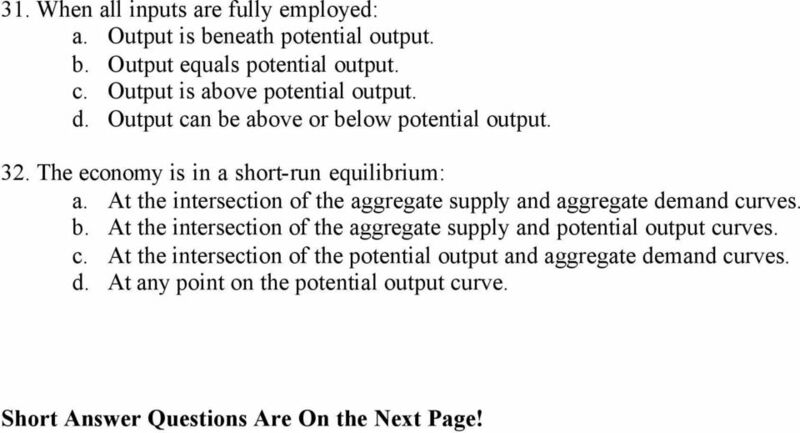 d. The aggregate supply and potential output curves. 30. A classical economist would be most likely to agree with which of the following statements? a. Government policies do not affect economic activity. b. Government can implement policy proposals that can positively impact the economy. c. Most government policies would probably make things worse. d. Government intervention in the market is necessary for a smoothly operating economy. 6 31. When all inputs are fully employed: a. Output is beneath potential output. b. Output equals potential output. c. Output is above potential output. d. Output can be above or below potential output. 32. The economy is in a short-run equilibrium: a. At the intersection of the aggregate supply and aggregate demand curves. b. At the intersection of the aggregate supply and potential output curves. c. At the intersection of the potential output and aggregate demand curves. d. At any point on the potential output curve. Short Answer Questions Are On the Next Page! 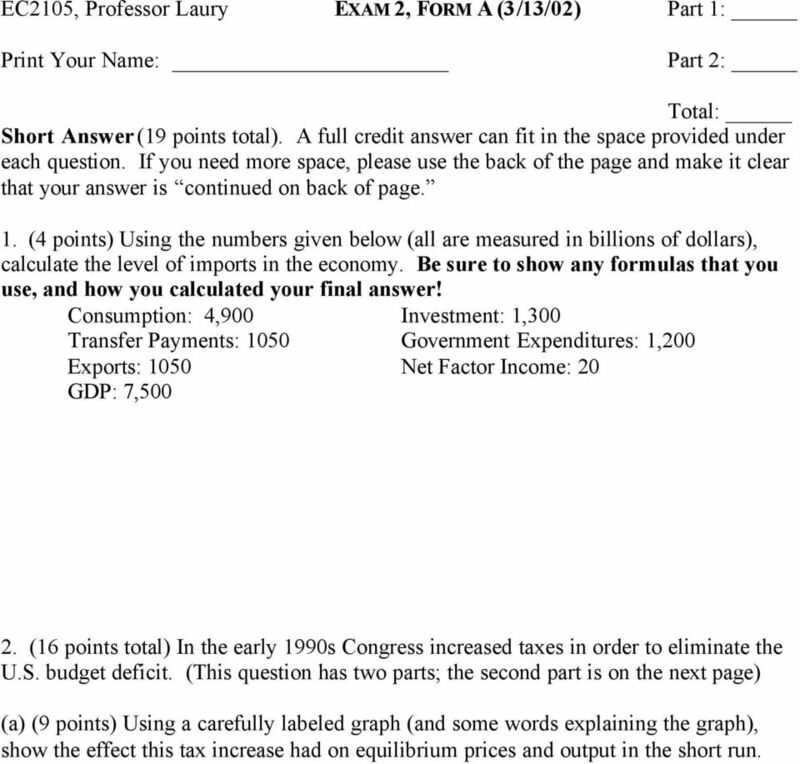 7 EC2105, Professor Laury EXAM 2, FORM A (3/13/02) Part 1: Print Your Name: Part 2: Total: Short Answer (19 points total). A full credit answer can fit in the space provided under each question. If you need more space, please use the back of the page and make it clear that your answer is continued on back of page. 1. (4 points) Using the numbers given below (all are measured in billions of dollars), calculate the level of imports in the economy. Be sure to show any formulas that you use, and how you calculated your final answer! Consumption: 4,900 Investment: 1,300 Transfer Payments: 1050 Government Expenditures: 1,200 Exports: 1050 Net Factor Income: 20 GDP: 7, (16 points total) In the early 1990s Congress increased taxes in order to eliminate the U.S. budget deficit. (This question has two parts; the second part is on the next page) (a) (9 points) Using a carefully labeled graph (and some words explaining the graph), show the effect this tax increase had on equilibrium prices and output in the short run. 8 (b) (7 points) Using another carefully labeled graph (and some words to explain it), show the effect this tax increase had on equilibrium prices and output in the long run. Exam 1 ECON 2105 Dr. Susan Laury. Thurs. Feb. 6, :00 p.m. Form B. There are 40 multiple choice questions, worth 2.